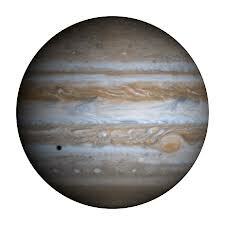 The largest planet in the solar system, Jupiter is covered by swirling clouds of hydrogen, helium and ammonia. Huge storms and raging winds create the swirled colors of Jupiter’s atmosphere. The Red Spot, a gigantic storm, has been visible for at least 300 years. All about Jupiter, the largest planet in the solar system. Scientists still have a lot to learn about Jupiter. They know that its atmosphere is similar to that of the Sun – mostly hydrogen and helium. If it was larger, the planet might have become a star. They also know that it has a strong magnetic field, much stronger than the Earth’s. The gases on Jupiter are so thick and heavy at the surface of the planet that they become liquid metallic hydrogen. Scientists believe an icy rock core lies at the center of the planet. 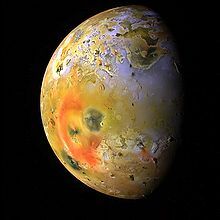 Io, one of the moons, has more volcanoes than any other planet in the solar system. Jupiter has more than 50 moons. Four of the moons are the size of planets. Europa probably has a liquid ocean beneath its crust. Ganymede is such a large moon that it has its own magnetic field. Jupiter has rings, a fact that surprised scientists. The Voyager 1 expedition discovered the rings in 1979. The thick rings are made of dust and bits of rock. 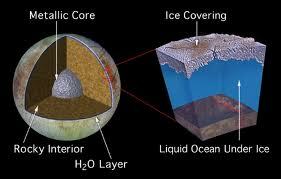 Europa (A Jupiter Moon) probably has a liquid ocean beneath its crust. A video of the top 5 amazing facts about Jupiter. Question: What is the temperature on Jupiter? Answer: The average temperature is a chilly -234 Fahrenheit. Question: How long is a year? Answer: A year on Jupiter is 4,331 days. Keep in mind, though, that a day on Jupiter is only 9 hours, 56 minutes – less than half a day on Earth. Enjoyed the Easy Science for Kids Website all about Jupiter info? Take the FREE & fun Jupiter quiz and download FREE Jupiter worksheet for kids. For lengthy info click here. Declan, Tobin. " Jupiter Fun Facts for Kids ." Easy Science for Kids, Apr 2019. Web. 21 Apr 2019. < https://easyscienceforkids.com/all-about-jupiter/ >.